The Item Master window is used to create and manage the price of available inventory items, as well as to print barcodes associated with Item Codes. In this grid there is an option to print barcodes associated with Item Codes. To select which Item(s) barcodes will be printed users should select the checkbox(s) in the first column, and then click on the Print Barcode button. A report in pdf format for the selected items will be generated in which Barcodes and Item Code(s) will be displayed. 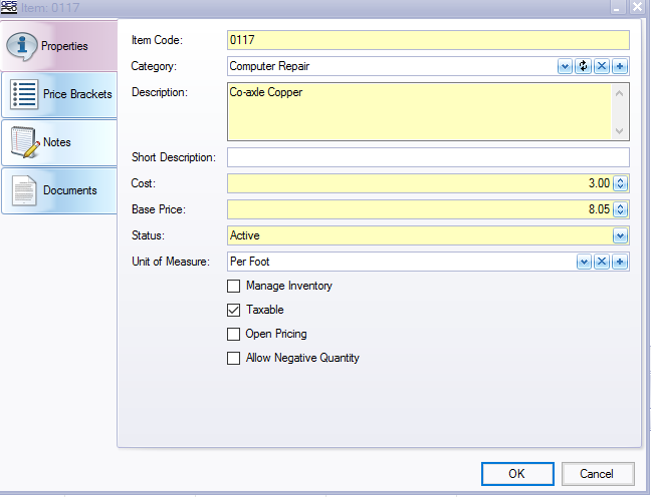 Manage Inventory determines whether an Item will be included in the Materials tab of a Work Order or not. The data from these items are required to match the field ticket and quantity used in the Operation Details. Open Pricing. When checked the Item pricing and Description can be modified by anyone who is editing or completing a Work Order, including field personnel. It is advisable to create at least one “Miscellaneous” item with this checkbox enabled in order to allow field personnel to add items to a Field Ticket that are not defined in the Item Master. Allow Negative Quantity will allow the user to add a second Item to a Field Ticket which has a negative quantity. This feature is used to add a credit for materials or services that are visible to the customer. The Reconciliation tab allows for further classification of items to link them to different related categories. The Inventory module can be found in the Back Office tab of the Navigation Menu. The Price Brackets can be found in the Item Master. Price Brackets is tab a user can use to assign each inventory item a range of prices. With this tab a user can include notes in plaintext, scanned copies of documents and any other files. For details on working within this tab, see “Notes“.